Oh my goodness, guys. My baby will be one in exactly a week. ONE! Do you know how incredibly fast time flies? Everyone told me to enjoy each moment since kids grow up faster than you can blink, and I didn't believe them until I looked at the calendar. Has it really been a whole year? I'm so incredibly lucky to be my little boy's mama. He makes me so happy and so proud each and every day. I'm also so fortunate to be able to stay at home and soak up every ounce of him each and every day (thanks hubby!). So, me being me, the preparations for Bradley's FIRST birthday party started about two months ago. Now that we're getting down to the wire and I don't have much free time, quick and delicious meals are my go-to for dinner. 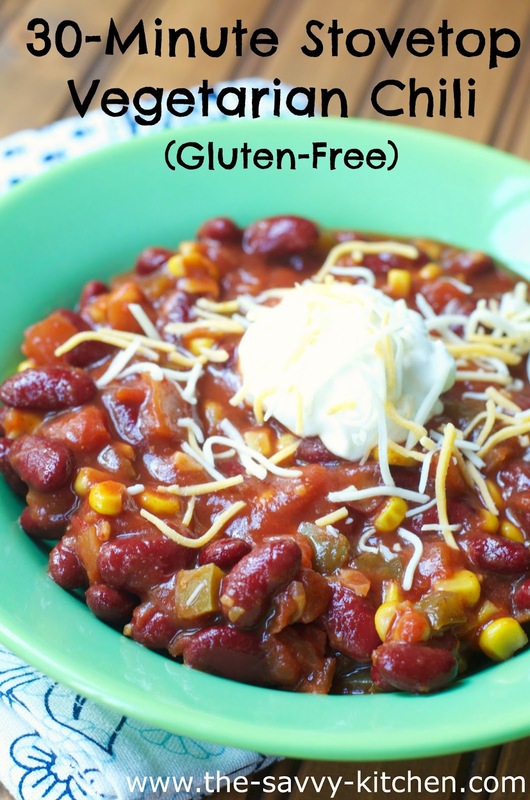 This chili is sans meat, but the lack of beef isn't even missing since the abundance of vegetables makes up for it. I packed in tomatoes, kidney beans, corn, onions and green peppers. 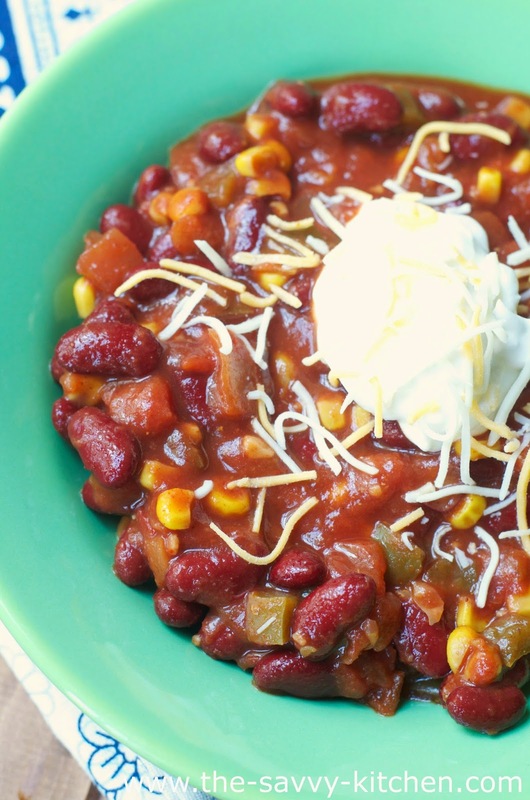 This is great if you're in a rush and still want some comfort food for dinner. Enjoy! 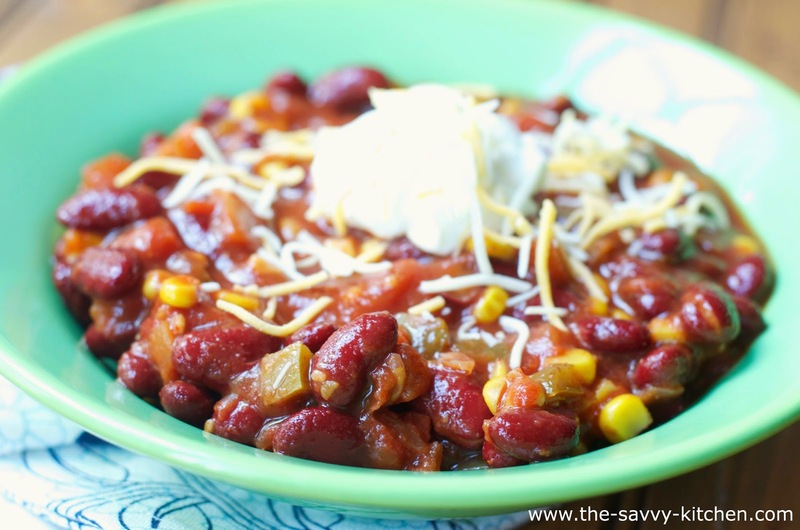 Combine all ingredients (except cheese and sour cream) in a large skillet or Dutch oven. Stir well. Allow to simmer over medium-low heat for 20-25 minutes, stirring often (the longer you can let it sit the better, but it will still taste great if you're in a rush). Serve in bowls garnished with cheese and sour cream, if desired.